I’m a passionate guy. When I enjoy something, I try to enjoy it to the fullest. And that goes for just about everything in my life. As a kid, more than anything else, I wanted to play in the NBA. Seriously. I used to play 6+ hours a day in the summer, working on techniques and fundamentals, doing boring shooting drills, just to eventually reach my goal of playing professional basketball. When I was in high school, and I had my sights focused on future goals, I’d apply myself fully hoping to know as much as I could about a subject or a class along the way. When I was a single man, I would throw myself into dating relationships (sometimes even unhealthily), hoping to become the best boyfriend ever. And even with hobbies, when I’m focused on something, I tend to have very addictive, even obsessive tendencies about them. Two years ago, when I started homebrewing, the only thing I knew about beer was that it was tasty…sometimes. But within months I had read several books, watched hundreds of how-to videos, and read many, many, many articles on the topic. It wasn’t long until I was able to make some pretty decent beer. And sure, there were some terrible brews along the way, but the more I learned about the science behind fermentation and the many different techniques of brewing, the better I got. And the same has gone for just about everything in my life. The more focused I was in school, the better I did. The harder I tried at being the best boyfriend, the better boyfriend I was. And this isn’t to say that this is an abnormal propensity at all. Obviously, the more you work at something and the more you try, the better you get. But like I said above, when I’m passionate about something, there is this insatiable need to know the most about or be the best at whatever it is that I’m focused on. 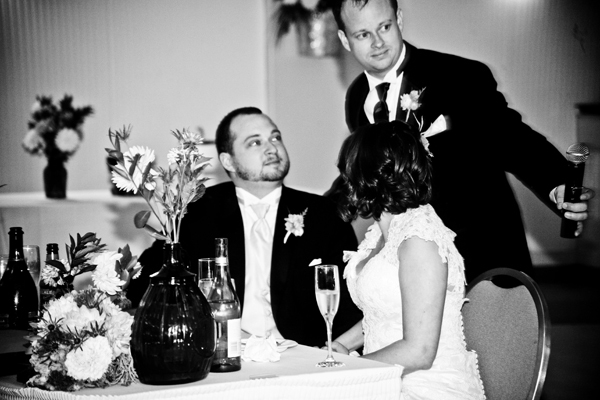 As the best man in my wedding, my brother gave a great speech during our reception. I honestly don’t remember a lot of it, but I do remember the main part (I hope). He talked about me being kind of a geeky guy, and that when I’m geeky about a something, I put everything I have into that. All of my work, all of my focus, all of my passion goes into whatever that subject might be. I was geeky about comic books, I was geeky about music, I was geeky about student affairs, and I was geeky about homebrewing. Then he said it was time for me to be geeky about my wife, Hannah. The crowd “Awwww”-ed and ate it up, and I shed a tear or two, gave the big galoot a hug and moved on. But I’ve thought about that speech in regards to my obsessive nature many times over the last seven months since then. While it’s a great thing that I was so passionate about those things, there was also a very abrupt end to most of them, which then transitioned directly into the next fanatical investment. This is partly why I had seven majors in college, and why (before my wife) I never dated a girl for more then eighteen months without breaking up with her…at least once. But because there is always an end to each of these fleeting passions, and usually an abrupt one, it can be tough when I try to find true fulfillment and satisfaction in these things. I put my all into these things, often finding my worth in my proficiency with these subjects, and there isn’t much room for much else when I’m full board into one of these passions. And that’s where it can get unhealthy. Whenever I’m shirking responsibilities or relationships for the sake of these fanatical dependencies, it’s a bad place to find myself. For me, it means I need to find consistency and balance. I’ve luckily been able to find a lot of that in my relationship with my wife, who keeps me sane and accountable to keeping these vices at bay and/or in healthy balance. For me, the insatiable focus and hunger about a topic can be a great thing, but it just needs to be kept in line. So while I’ve come to terms with the fact that I’ll never play in the NBA, and I’ve made my peace with not being a brew master at a local craft brewery, I am quite enjoying the high level of geekiness I have about the things that are of most importance to me. And if you ask my wife, I think she’ll tell you the same. ¹ Obviously, there are certain aspects of my life that I know no matter how I’m feeling, I will choose to be passionate about (i.e. my faith in the Lord, my relationship with my wife, my relationships with family and friends, my job, et al.). This entry was posted in Blog, Life Musings and tagged beer, god, Hannah Helms, homebrew, homebrewing, Jason Helms, wedding.